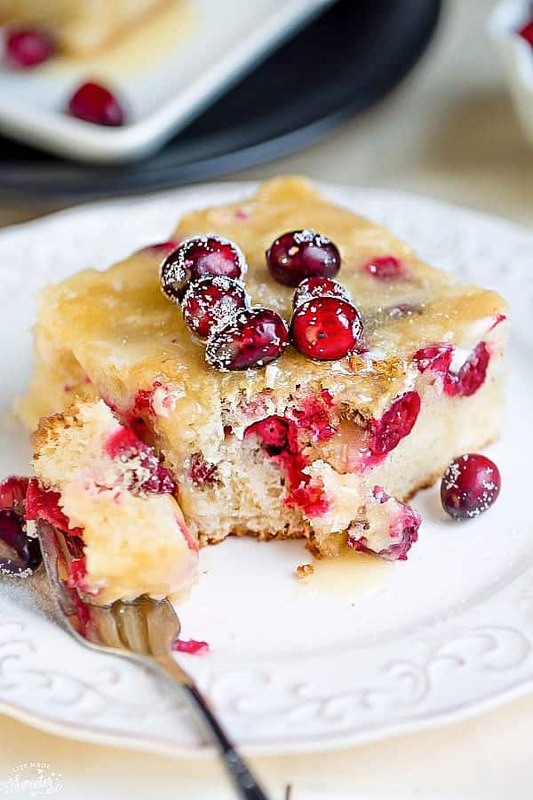 Cranberry Christmas Cake with Butter Sauce is a soft vanilla cake filled with fresh cranberries served with a warm buttery sauce. It’s easy to make & perfect for the holidays. 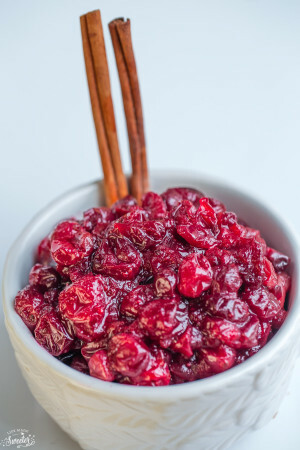 As much as I love cranberries, I always seem to forget about using them in a festive dessert. I had a full bag of cranberries leftover from the holidays and decided to toss them into a simple cake that I spotted in a Taste of Home magazine. It was a classic old fashioned cranberry christmas cake that was buttery-y and studded with fresh cranberries. The cake recipe had no leavening and required you to beat the eggs for a few minutes until light and fluffy. 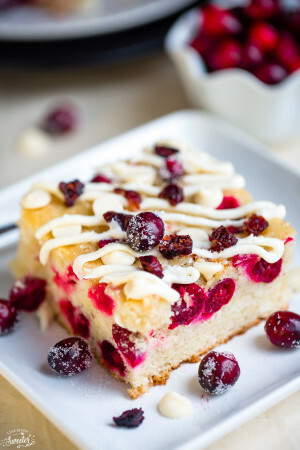 I loved the fresh cranberries but decided to adapt the cake using my favorite vanilla sheet cake recipe instead. This cranberry christmas cake recipe comes together fairly quickly using just one bowl and an electric hand mixer. First, you’ll add the regular dry ingredients like flour, sugar, baking powder and salt. Then you’ll add the eggs, melted butter, milk and vanilla extract and mix until combined. Finally, you fold in the cranberries and transfer the batter to large cake. Bake at 350 for about 30 minutes, or until the a toothpick inserted comes out clean. This bakes up into a soft and tender cake that will make your house smell amazing. And instead of frosting, each slice gets drizzled with a deliciously rich, warm buttery sauce made with just 4 ingredients. This Cranberry Christmas Cake would make a wonderful dessert for just about any occasion. It’s wonderfully soft and not too heavy or sweet. What I love is how simple and impressive this cake is. It’s always a hit at holiday parties and the bright cranberries add the perfect festive touch for any new year celebrations. 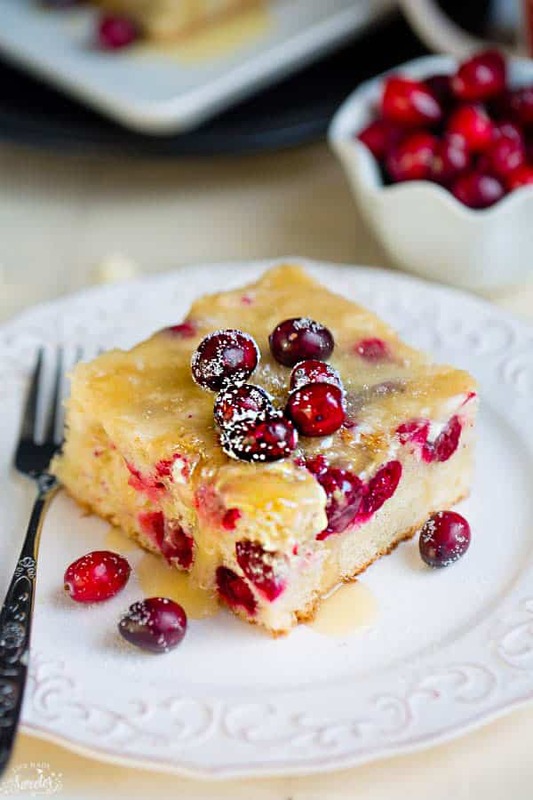 Cranberry Christmas Cake with Butter Sauce is a soft vanilla cake filled with fresh cranberries served with a warm buttery sauce. It's easy to make & perfect for the holidays. Preheat oven to 350 F. Line a 9 x 13 cake pan with parchment paper with a slight overhang and set aside. In a large bowl, whisk together the flour, sugar, baking powder, and salt. Add the eggs, melted butter, milk, and vanilla. Using an electric hand mixer, mix on medium speed until smooth, about 3 minutes. Fold in cranberries. Pour the batter into the prepared baking sheet. Transfer batter to prepared pan. Bake for 31-38 minutes, or until lightly browned and a tooth pick inserted near the center of the cake comes out clean. Let cool completely and cut into slices or small squares. Cook until the sugar and butter melts and everything has blended. Turn up heat and boil for one minute. Poor hot sauce over warmed cake.